Semi-Machined adapters for Gator and other manual lathe chucks. FLA Adapters - Fully Machined Steel Adapters for PA, Steel Body Adjustable Chucks 0.0004” T.I.R. FLE Adapters - Fully Machined Adapters for EA, Cast Iron Adjustable Chucks 0.0005” T.I.R. FLD Adapters - Machined cast-iron Adapters for Gator Plain Back SCROLL Chucks. These adapters require a final “skim cut”to mate up with the back of the chuck. Mounting holes are already drilled and counter bored. FL Adapters - Semi-Machined cast-iron Adapters for Plain Back SCROLL and INDEPENDENT Chucks. These adapters are “blank” on the chuck side and require the adapter boss to be turned down to mate up with the counterbore on the chuck (press fit recommended). 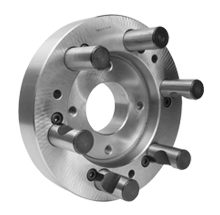 These adapters also require mounting holes to be drill and counter bored for scroll chucks or drilled and threaded for independent chucks. FLI Adapters - Fully Machined Adapters for PI Independent Chucks. Gator is the only producer that supplies Fully Finished Adapters for Independent chucks.